The MT2090 Wireless Barcode Kit boasts Industry-leading ergonomics coupled with advanced data capture capabilities and an 802.11 b/g WLAN Radio, all with a low total cost of ownership. 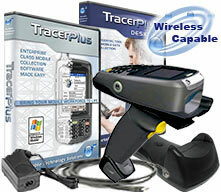 Featuring TracerPlus Professional data collection software along with the very rugged, yet value priced MT2090, this kit is ideal for a variety of mobile applications including inventory counts, price markdowns/re-labeling and product picking/pulling. The Symbol MT2000 Series offers the same drop specification as Motorola's high-end rugged devices. The 6 ft. drop specification plus IP54 sealing combine to help ensure reliable operation in spite of everyday drops, bumps and exposure to dust and liquids.